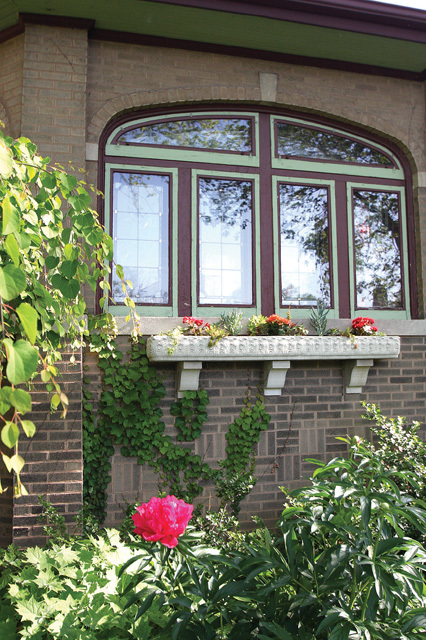 In circa-1920s Chicago, when architect Benedict J. Bruns was designing brick bungalows for the future neighborhood of Rogers Park Manor on the city’s far North Side, he could not have imagined that the sturdy garage roof of one bungalow in particular would someday make the ideal spot for a modern- day Victory Garden. Nor did he factor into his design a state-of-the-art chicken coop or space for beehives. Beth, a Chicago-area native, and Ken, who hails from Idaho, are certainly nature lovers—they married in Glacier National Park—and history buffs. 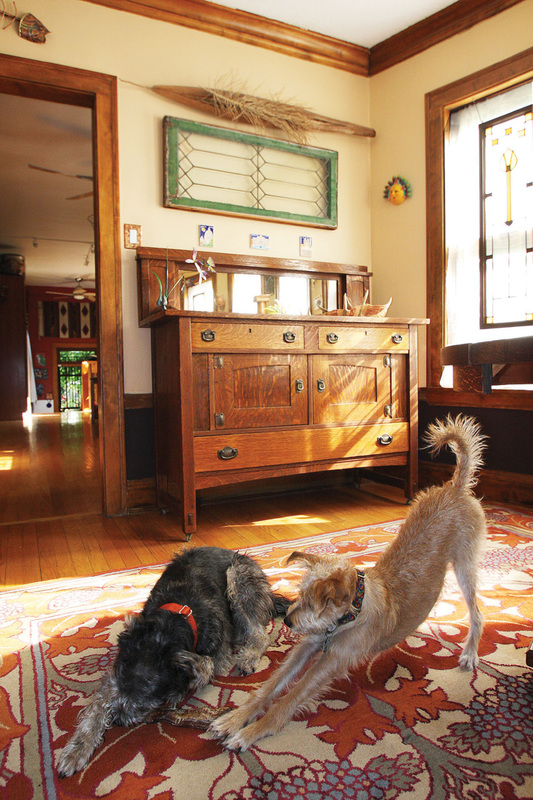 They started out in a condo but wanted a home with more character, either a greystone (the second-most-prevalent housing type in Chicago) or a bungalow (the most prevalent). They set their sites on Rogers Park Manor. In the competitive Chicago bungalow market, it’s well known that in certain neighborhoods, successful homeseekers must find their homes before they’re even listed. In the late ’90s, Beth and Ken resorted to stalking the neighborhood, where they hoped to buy a “jumbo” roundfront or octagon bungalow. They wanted the extra space for their many projects and hobbies—Ken’s woodworking and Beth’s drawing, painting and ceramics. When Ken introduced himself one day to an older gentleman who’d just walked out of his octagon bungalow and asked him if he knew anyone who was thinking of selling, the man enthusiastically replied, “I am!” A few months later, the bungalow was theirs. Not many chickens are forever immortalized in art, but Pickles, Tye Dye, Lacey, Crush, Squeak and Tinker certainly are. 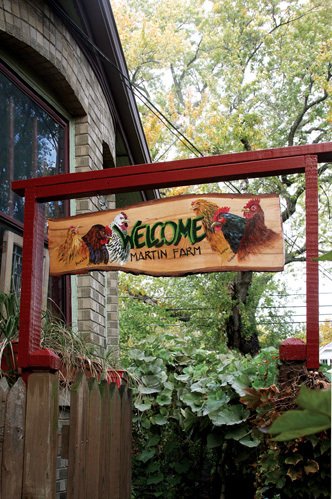 The sign was crafted from a fallen maple.A stroll past the Martin bungalow gives just a hint of the lush retreat behind the garden gate. The climbing hydrangea covering the buff brick looks beautiful, but it also keeps the house cooler in summer and warmer in winter. Greenery surrounds the prominent octagon bay front, but you won’t find a single blade of grass; it was replaced long ago with native and drought-tolerant plant species. The towering maple in the parking strip stands amidst a patch of hostas that shades the tree’s roots. It was this first project, eradicating the grass in the parking strip to get more water to the tree’s roots, that led the couple down the garden path. Like most Chicago bungalows, the Martin home sits on a long, narrow lot. The house, with its large footprint, and the detached garage take up the lion’s share of the lot, leaving a small backyard space. The labyrinth-like pathway to the backyard begins at a gate under a hand-painted welcome sign featuring portraits of “the girls,” the Martin hens. (Beth painted the sign on wood from a fallen maple to welcome guests arriving on a Windy City Coop Tour.) Along that narrow path are a neat row of composters, quietly turning kitchen and garden waste into rich soil. There are also several rain barrels that, most years, provide much of the water for the plants. 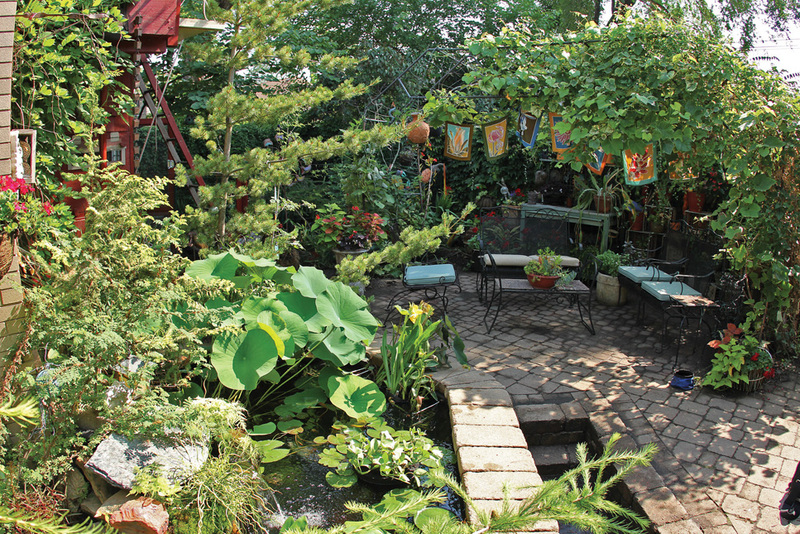 Once past the house and a shade arbor covered with squash vines, the path opens onto a patio area with not one but two koi ponds, complete with frogs who eat out of the Martins’ hands. Just behind them, next to the garage, is an award-winning chicken coop. 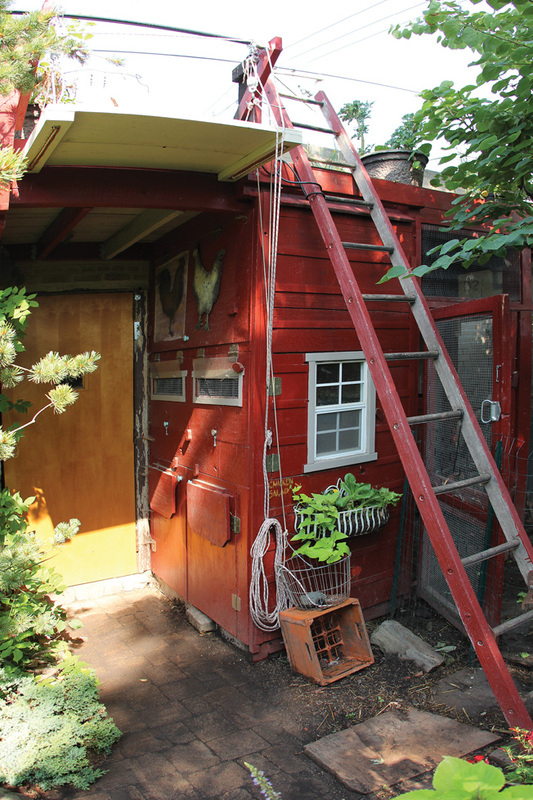 Made from mostly recycled materials, including the 40-year-old fence from Beth’s childhood home, the cherry-red coop has plenty of room for the Martins to move around in comfortably while tending the girls or collecting eggs. This summer, what you’d find on the roof of the coop and the garage is a lush but orderly garden of squashes, tomatoes, peppers, greens and anything else the Martins can squeeze in (including two beehives). To keep it all flourishing, they will lug hundreds of pounds of dirt, water, tools and plants up there during the growing season. The Martins have learned quite a bit about the history of the homes in Rogers Park Manor, which is now registered as a National Historic District thanks to Beth’s painstaking research and help from the Historic Chicago Bungalow Association. The HCBA, founded in 2000, was just getting off the ground when Ken and Beth joined. 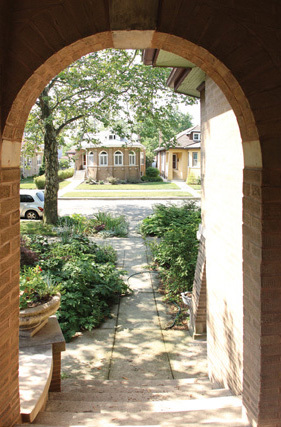 The organization is vitally important to the city’s bungalow owners, providing resources and information on finding grants, loans and tax relief for green renovations and energy-savings on these historic structures. They also help neighborhood representatives wade through the paperwork of getting historic designation on the National Register of Historic Places. Living as sustainably as possible, even in the nation’s third-largest city, was a natural choice—but it wasn’t an easy one. Some of their practices have raised the eyebrows of neighbors, and the Martins are regularly on the receiving end of good-natured ribbing from family and friends. But one man’s trash is another man’s treasure, and the Martins just can’t help themselves from trying to find a purpose for something others toss as useless. Beth credits her late father, a WWII vet, for her tendency to make sure that anything that can be used, will be used. Sometimes, it’s an altruistic attempt to preserve the past, such as using the wood, slate and nails from a burned historic building at Indian Boundary Park to make frames, or hundred-year-old shards of glass from hail-damaged Garfield Conservatory to make chimes (the sale of both projects will help fund the renovation of these structures).But most of the time, it’s simply finding another use for what most people perceive as trash. “My mother was throwing away some down pillows that were probably 40 years old. I said, no, I’d take them, the birds will use it to make their nests. She just looked at me and said, ‘Well, I got one really odd daughter in you!’” Even though they seem orderly and highly organized (they’d have to be), they tend to follow their gut in how they choose to live. 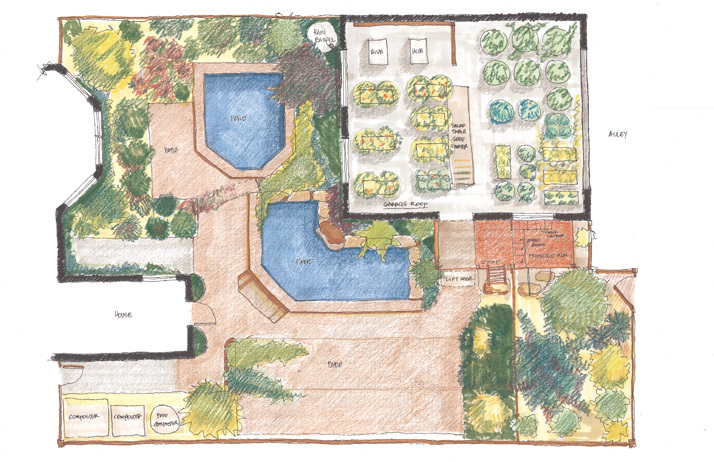 The layout of the backyard is much bette runderstood with Beth’s drawing. The Martins have made good use of every available inch of space. Special thanks to the Martins for sharing their story and providing all photographs, with the help of Beth’s brother, Jeff of Jeff Berger Photography (jeffbergermedia@gmail.com).